The entire event summed up in one image. Extreme Rules 2018 is mercifully over. As expected, it was filler, but not just an ordinary filler. It was a catastrophe. An embarrassment. A damning indictment of a creative process that only seems to get worse as time goes on. This company should be embarrassed, ashamed, and humiliated at the poor show it put on last night. In my opinion, this event was even worse than Backlash. At least Backlash had the awesome opener between Seth Rollins and The Miz. This had almost no redeeming qualities whatsoever. Almost every match fell short of expectations, and the booking was, as we should expect in 2018, dismal. One bump out of four hours doesn't make for a good pay per view, sorry. 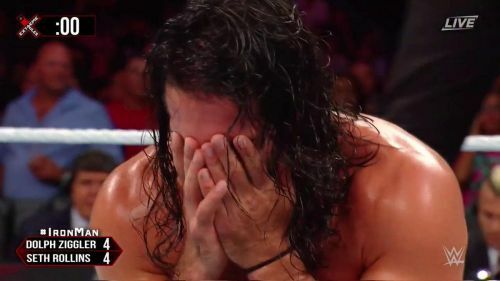 SummerSlam doesn't look so endearing now, does it? Nevertheless, were there any winners that managed to come out of this pile of garbage? Sportskeeda is the one-stop destination for latest WWE rumors and wrestling news. Remember when everyone wanted the broken gimmick in WWE? Yeah, look how that turned out. Matt Hardy and Bray Wyatt hardly set the world on fire as the Raw Tag Team Champions, but this was a total burial. First, Hardy loses to both members of the "B Team," who had been portrayed as comedy jobbers even into this feud, and then the team loses at the PPV. That was against expectations, but expectations were put in place because they made sense. This didn't make any sense at all. Logic would indicate that the "B Team" are just keeping the championships warm for the Authors of Pain to demolish them at SummerSlam, but as we saw last night, logic is not this company's first language. As it stands, we have no idea how this will go.